In a remote hospital, a patient waits in bed for an operation. Standing bedside is not a surgeon but a human-faced machine, equipped with three-dimensional cameras, high-precision sensors and ultra-tiny instruments. A large screen projects the face of a doctor, who controls the procedure through the robotic surgeon to check on the patient’s condition in real time using the latest telepresence technologies. The virtual operation, already in use in some parts of the world, is only a part of changes that robotics scientist You Bum-jae projects cognitive, human-mimicking and network-based machines can bring to daily life. “Technologies are still limited and doctors can only see and hear, but it is only a matter of time before telemedicine robots enable doctors to feel patients without being there,” said You, director of the Center of Cognitive Robotics Research at the Korea Institute of Science and Technology. Eight years ago, You developed the world’s first network-based humanoid called Mahru, whose latest version, unveiled in 2010, can recognize items and tasks such as house cleaning, operating a microwave and performing other household chores. You, 50, has been leading the research to push the boundaries of virtual reality, focusing on technologies that enable people to interact without space or time constraints. More than 200 researchers from KIST, the Electronics and Telecommunications Research Institute, KAIST, GIST, Hanyang University and Sangmyung University are taking part in the nine-year project. “The purpose of our research is to enable people to experience virtual and remote worlds as if they were the real world,” the director of the Center of Human-Centered Interaction for Coexistence told The Korea Herald in a recent interview. You and his colleagues are now working on a three-dimensional teleconferencing system. Part of the research is to create a “coexistence space” where people can not only see and talk to each other, but also touch and feel, he explained. “We’re working on wearable devices for real human senses,” he said. He noted that a successful project would change the way people play, work and learn. Being able to interact with others will be very crucial in a rapidly aging society, he said. “More elderly people feel isolated and abandoned. But if robotic avatars can transmit back the full experience of being with others, we can help to reduce social isolation and increase social interactions,” he added. He admitted that the project, still the very early stages of development, may take a bit longer than expected. “It’s really a tough project because we’re developing a completely new concept, finding core technologies,” he said. He is also disappointed at the trend of young students shunning science over more practical subjects. He also called for a change in the evaluation system of academics, which is currently focused on quantity rather than quality. “Researchers need time, not just one year but at least four to five years, to really focus on developing new ideas, concepts and technologies. The evaluation system isn’t helping this at the moment,” he added. You was inspired by robot animations such as “Astro Boy” and “Robot Taekwond-V” in the 1970s. “I always pictured myself as the old man wearing a white coat and standing behind the robot characters,” he said. He first came to prominence in 2005 by introducing Mahru. Mahru ― the Korean word for “top” ― is a network-based humanoid robot designed to mimic human body movements. The 1.5-meter, 67-kilogram robot can walk, bend and rotate its head to make eye contact. He said he still vividly remembers the night that Mahru took his first step. He rushed down to the laboratory, and saw Mahru making three full steps and stand still. “That was one giant leap for our research,” he recalled. His team at KIST continued the research, and made headlines in 2010, when they unveiled the robot’s latest version Mahru-Z that can perform dance and taekwondo moves and even pop a snack into the microwave. But since then, he has stopped working on humanoid projects and Mahru-Z has been left at the side of his laboratory for years now. Cost was the main obstacle for humanoid robots such as Mahru to be mass produced. “Currently, it costs more than 250 million won ($236,000) to manufacture just one Mahru-Z, and retailers would need to sell it at between 600 million and 700 million to make some profit,” he said, adding that robots are still not seen as profitable. Safety was another major concern. Honda’s Asimo robot, known as the world’s most advanced humanoid robot, is used only in a limited area for non-commercial purposes, he noted. “They look, they walk like humans, but still the robots’ walking is unstable. Imagine, what if they walked normally for 364 days (in a year), but lost balance the next day and fell on glass or people, it would be a nightmare. A year’s effort would go to waste,” he said, adding that many researchers are now having second thoughts about robots mimicking humans’ walking. Also, the March 2011 tsunami and subsequent Fukushima nuclear disaster was a wake-up call for robotics engineers and scientists. The disaster made it clear robots were only capable of playing a very limited role in containing a nuclear accident, and has since encouraged many to focus on developing robots that can perform rescue operations. He said he believes it will still be long before robots can assist humans in manmade or natural disasters, in situations dangerous for rescuers. However, he still hopes to see more interest from young people in robotics as it is a promising field. It is now clear that humanoid robotics is a rising future field, as seen by firms such as Google or NASA that are already investing heavily in advanced robotics. “I’m very positive about the future, and one day I hope to be able to provide artificial intelligence to Mahru,” he added. ● You Bum-jae is the director of the Center of Human-Centered Interaction for Coexistence, an R&D program funded by the Ministry of Science, ICT and Future Planning. He has worked as a principal research scientist at KIST since 1994. 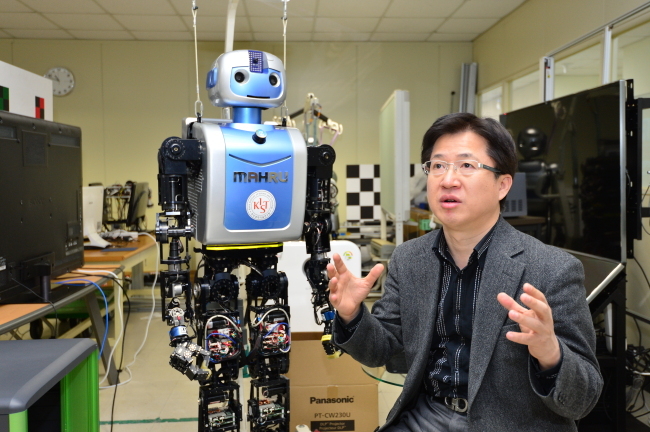 ● He also served as a director of the Center of Cognitive Robotics Research at KIST, developing the world’s first network-based humanoid robots, the Mahru series, from 2004-2011. ● He graduated from Seoul National University with a bachelor’s degree in control and instrumentation engineering, and earned his doctorate degree in electronic and electrical engineering at KAIST.